National Agency for Food and Drug Administration and Control (NAFDAC) has arrested and paraded alleged importer of fast moving counterfeit medicines, mainly anti-bacterial cream and cosmetics, worth N106, 210 million in Lagos. 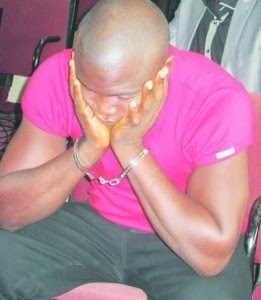 The drug counterfeit dealer, Mr. Olisaemeka Osefoh was arrested following a tip-off, when operatives from NAFDAC Investigation and Enforcement Directorate raided a warehouse located at Progressive Traders Market known for the sales of jewelries and cosmetic products, within Trade Fair Complex, Badagry Expressway, Lagos. Some of the counterfeit medicines discovered and impounded were; Skineal Cream (I58 cartons x 10 x 24 x 15g), Funbact-A Cream (43 cartons x 3O x 12 x 30g), Mycoten Cream (719 cartons x 40 x 10 x 20g), Neurogesic Ointment (131 cartons x 40 x 10x35g), Rough rider Condom ( 56 cartons), Iman Luxury Powder ( 20 cartons) and Heal Balm (205 cartons). Addressing journalists, Thursday, Dr. Paul Orhii, Director General, NAFDAC, confirmed and described the arrest of Mr. Olisaemeka Osefoh, as among one of the ground breaking efforts of the agency, urging members of the public, landlords and market union members to report any suspicious activity relating to NAFDAC regulated products around their community to the nearest NAFDAC office for immediate action. His words: “The Agency in the past week has arrested and investigated one Mr. Olisaemeka Osefoh for importation of counterfeit medicines into the country. Following a tip-off, operatives from NAFDAC Investigation and Enforcement Directorate raided a warehouse located at Progressive Traders Market known for the sales of jewelries and cosmetic products, within Trade Fair Complex, Badagry Expressway, Lagos. According to the Orhii, the products were deliberately packed in plain cartons and wrapped in sacks to conceal their real identities. Also of note is that the Mycoten Cream and Neurogesic Ointment were labeled as manufactured in Nigeria, although they were imported. He condemned drug counterfeiting, saying that it is worst than armed robbery and other crimes. The NAFDAC boss pointed out that latest findings has proved that drug counterfeiters now operate from markets that deal on other commodities to shield their dubious activities from law enforcement agencies. “Recent discovery has revealed that drug counterfeiters now operate from markets that deal on other commodities so as not to draw the attention of law enforcement agencies on their nefarious activities,” he said. The Director reiterated the agency’s determination to rid the country of fake and unwholesome drugs. “However, I want to reiterate that there will be no sacred cow in the fight against counterfeit medicines; any counterfeiter arrested will be prosecuted according to the law of the land,” he said. He pledged to reward in monetary terms any member of the public, landlord and market union who reported any suspicious activity relating to NAFDAC regulated products around their community to the nearest NAFDAC office for immediate action, just as their identities will remain confidential. The NAFDAC DG added; “this is part of their contribution in the fight against counterfeit and fake products.” He announced that NAFDAC will from now begin to clamp down on landlords of warehouses stocked with counterfeit drugs and other substandard regulated products. “It is also imperative to mention that landlords of warehouses stocked with counterfeit drugs and other substandard regulated products will henceforth be arrested and prosecuted as accomplices,” he said. This story was published in Daily Newswatch on May 11, 2013.